So I had this idea I wanted to try and it sidetracked me. Julia will laugh, cause we did chat about this on our fabric store outing, the way I get an idea and have to shove everything to the side and experiment. My son thinks I must had ADD. Who knows? Anyway the idea is first, then there is a sort of Gelli Plate … not really a substitute, but I guess I’ll explain that after the technique that led me to it. 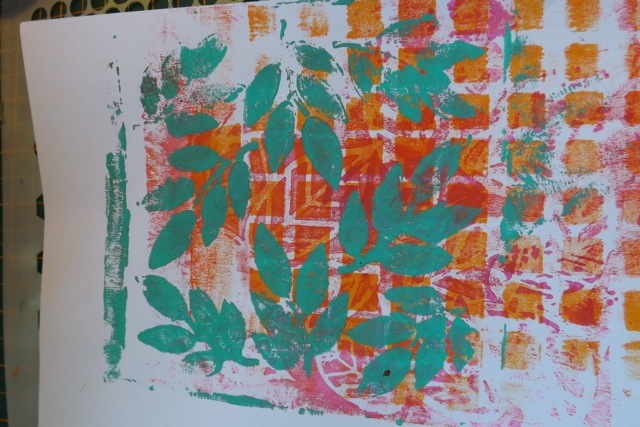 I think once you brayer on the 2nd colour, adding some texture to it, with bubble wrap or stripped back cardboard or maybe a grid, could really make it interesting. But I need to talk about where that led me! I knew that brayering paint on thru the stencil by blobbing paint on the top then brayering wasn’t going to work very well. The paint is too thick and it gets caught in certain areas, usually right where you blob it on, and I wanted a more uniform coverage. 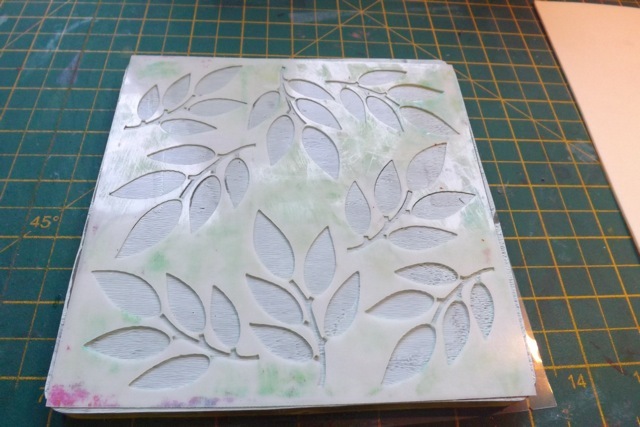 I happened to grab a piece of fun foam and blobbed on the paint to first spread it out and load the brayer then brayer to more uniform coating over the stencil. QI, as they say on TV. 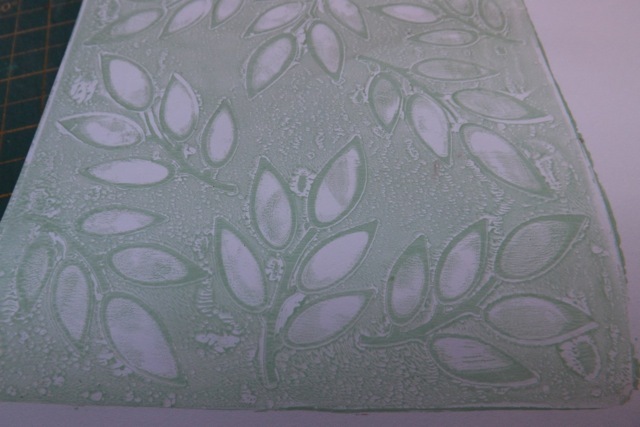 The fun foam shares some properties with the Gelli plate, in that it is soft and gives (unlike the monoprinting using a glass mat, for example) and it imparts a bit of a texture cause the foam is slightly rough. One problem is the paint dries on it fairly quickly, more so than it does on the Gelli. I thought I could pull a print off the foam so I did. 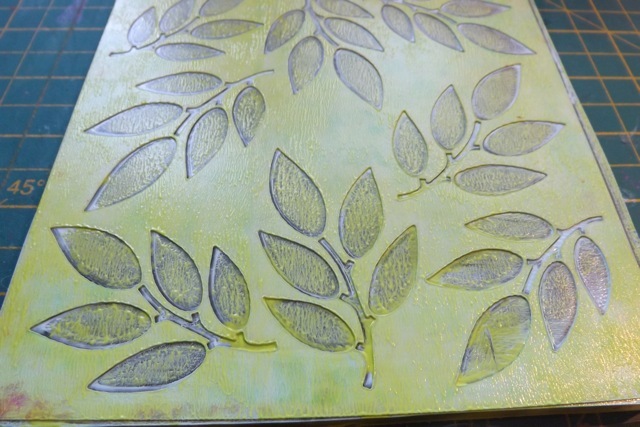 First I added more paint – more than I would on the Gelli, then added a dollop of what I had, which was glaze medium. Anything that extends the open (wet) time of the paint should work. I think flow medium might be the better product but I didn’t have that. I brayered that all over the fun foam. Then I first tried pressing bubble wrap on it. That worked better in some areas than others. Maybe better still with slightly drier paint? Wanted to change colour and found the foam cleaned up with a baby wipe almost as easily as the plate does! 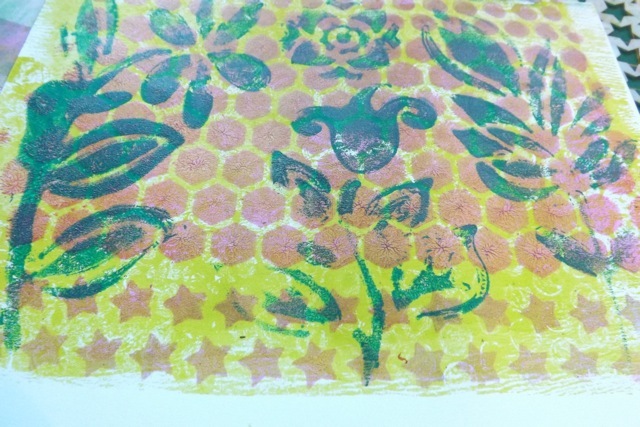 Wondered if the give in the foam would make pulling a print thru a stencil satisfactory – and it does! Here is another one I did – really like that one! What you can see is it’s kinda patchy, probably due to the paint not staying as wet. but I think you can see the layers: square stencils, leaf ribs, leafy frond, and somewhere in the back there is plastic canvas grid. OK so what use is this? This is how I see it: I LOVE my Gelli plate. I wish it hadn’t taken me as long as it did to cave in to the desire to have one. I wondered if I would like the process, if I would find the resulting prints useful and usable or would they just pile up? Before I bought the plate I looked around for whatever I could find for a Gelli Plate Substitute or Faux Gelli Plate or Homemade Gelli Plate. Nothing seemed easy – I was not going to make a plate, figure out how to store it, an end up letting it rot quietly if I lost interest. 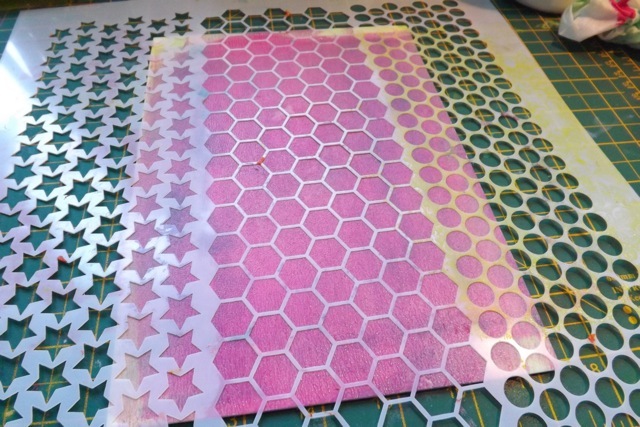 The hard glass mat didn’t appeal, and (did I see or just imagine a craft mat might work?) I don’t have a craft mat, just a Teflon liner from the £ store. 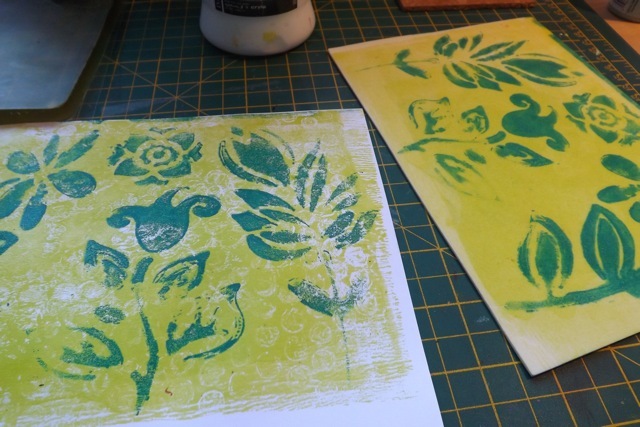 If I DID have a craft mat, I wasn’t going to use it for monoprinting. 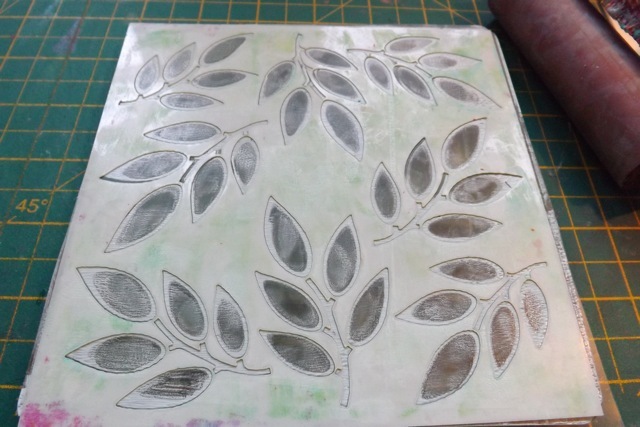 But I certainly can see how someone might feel like I did, that they WANTED a Gelli plate but were just not sure it was worth buying one, if in the end they didn’t enjoy the process. 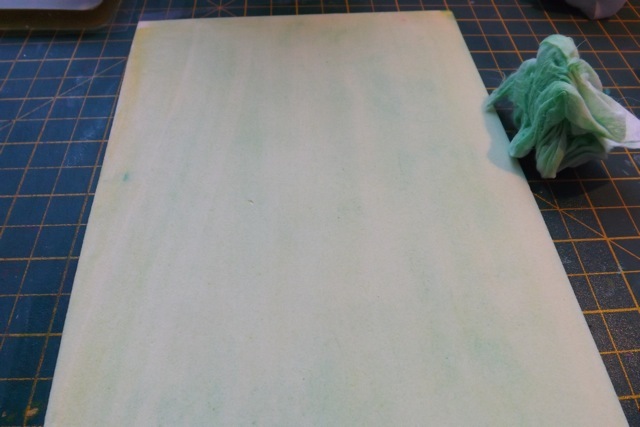 I think the fun foam is cheap, it cleans up pretty quickly and well, and while the prints are no where NEAR as nice as the actual Gelli prints, they are usable. 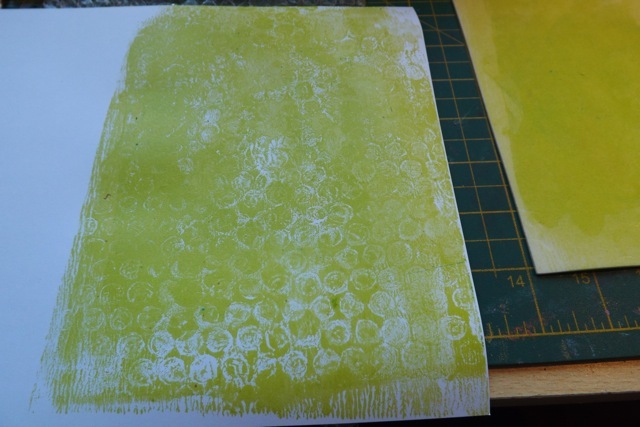 The process is similar enough you can surely get a sense of what Gelli printing is like. So I see this as a “gateway” tool/technique. 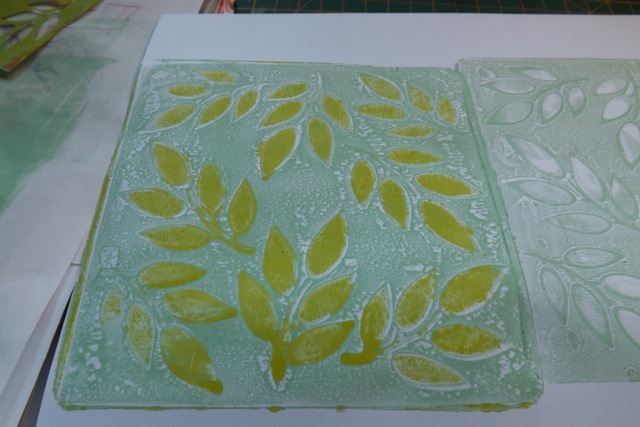 If you try monoprinting with fun foam, you find you like doing it and like the prints then I promise you, you will ABSOLUTELY LOVE the Gelli plate! And really? who DOESN’T have a sheet or two of fun foam lying about?